CRM Bulk Export Tool Available for CRM 4.0 and CRM Online!! There is no facility to Bulk Export the data from Microsoft Dynamics CRM 4.0. This sample tool allows users to connect to OnPremise or Online Microsoft CRM 4.0 organization and export data for CRM entities in form of CSV files. If you are connecting to OnPremise CRM Organization, make sure to open Internet Explorer, connect to CRM server and Save Password. This is necessary as this tool uses stored credentials to connect to the CRM server in OnPremise configuration. 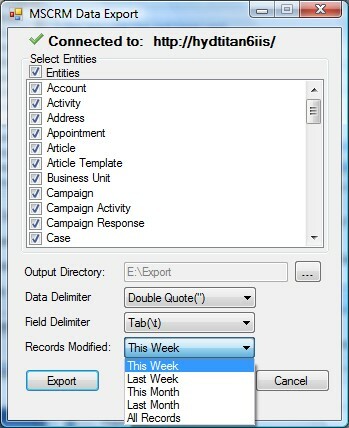 Once you are connected successfully, you can select the entities for which you want to export the records, specify output directory, data and field delimiters, and duration. Note that All Records option is not available for Online configuration. Click Export button to export the records. The tool creates CSV for each selected entities in the directory selected.